The worlds lightest interchangeable single focal length lens LUMIX G 14 mm / F2.5 ASPH. the compact LUMIX G 14 mm / F2.5 ASPH. The integration of stepping motor and inner focus drive system realizes the use of silent, high speed contrast AF. 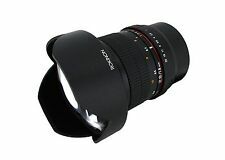 Rokinon Canon EF 14mm f/2.8 IF ED UMC Lens For Canon. Condition is Used. Shipped with USPS Priority Mail. Barley used Rokinon 14mm f2.8 umc. Literally only used it 4 times. I bought it with the intention of furthering my interest in photography but I didn’t have the time. It is in excellent shape! VERY FAST, VERY WIDE ANGLE LENS. NEW! 1 x Panasonic 14 mm F2.5 lens. 1 x ND filter for the Panasonic lens. 1 x lens cap. 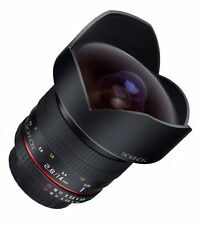 This is Rokinon's newest lens. It is a 14mm F2.8 IF ED MC Aspherical Super Wide Angle Lens. 14mm Ultra Wide F2.8 Lens. Maximum Aperture: F2.8. Focal Length: 14mm. Condition is used, but in excellent condition. Never had issues with it. I am not the first owner, but the previous took very good care of it. No blemishes or scratches either. This beautifully constructed lens is a 14mm F2.8 IF ED MC Aspherical Super Wide Angle Lens. 14mm Ultra Wide F2.8 Lens. Maximum Aperture: F2.8. Focal Length: 14mm. $SquareTrade © AP6.0 PRESENTS: SAMYANG 14mm Ultra Wide F2.8 Lens Pentax Mount The NEW Samyang 14mm Ultra-Wide Angle F/2.8 IF ED UMC Lens is the highest quality affordably priced 14mm lens on the market. It is designed for full frame cameras and is fully compatible with APS-C cameras as well. Its build and construction are superb! The lens construction is 14 elements in 12 groups and features 2 ED lens elements, one hybrid aspherical lens element and one glass aspherical lens element. All of these lens elements combine to minimize distortion and chromatic aberrations. Your pictures are sure to come out razor sharp and clear, even at the corners! The Samyang 14mm lens features a remarkable 115.7° angle of view on full-frame cameras and a 93.9° angle of view on APS-C cameras. 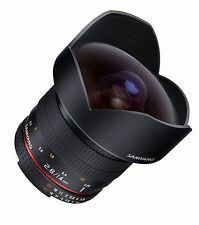 $SAMYANG 14mm Ultra Wide F2.8 Lens This beautifully constructed lens is a 14mm F2.8 IF ED MC Aspherical Super Wide Angle Lens. Samyang has it available in all camera mounts. This listing is for a Canon mount. This lens is designed for full frame cameras but can also work on APS-C cameras as well. This professional lens features 2 ED, one hybrid aspherical, and one glass aspherical lens element. The lens offers an impressive 114° field of view on full frame cameras and 92.5° on APS-C cameras. SPECIFICATIONS: ---Focal Length: 14mm ---Angle of View (Full Frame): 114° ---Angle of View (APS-C): 92.5° ---Maximum Aperture: F2.8 ---Minimum Aperture: F22 ---Lens Construction: 14 Elements/12 Groups ---Number of Diaphragm Blades: 6 ---Minimum Focus: 0. New for Sony E-Mount! Will work on Full Frame! Rokinon 2.8/14mm ED AS IF UMC, The lens is in good shape. It does have a few very unnoticeable hairline scratches. USED Panasonic 14mm F2.5 Lens. This lens is for micro four thirds series. It has been regularly used with normal signs and in good working condition. Hong Kong 1-2. South Africa 4-5. Germany 4-5. France 4-5. The NEW Samyang 14mm Ultra-Wide Angle F/2.8 IF ED UMC Lens is the highest quality affordably priced 14mm lens on the market. Its build and construction are superb! Super multi-layer coating to reduce flares and ghost images. Panasonic Lumix G 14mm F/2.5 ASPH Lens Black. The worlds lightest interchangeable single focal length lens LUMIX G 14 mm / F2.5 ASPH. the compact LUMIX G 14 mm / F2.5 ASPH. The integration of stepping motor and inner focus drive system realizes the use of silent, high speed contrast AF. 14mm f/2.8 ED AS IF UMC Lens for Sony E Mount. Ultra Wide-Angle 14mm Lens. 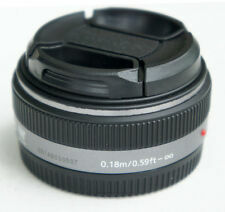 Manual Focus Lens. Built-In Petal-Type Lens Hood. Front Lens Cap. Rear Lens Cap. Lens Pouch. Our warranty covers labour costs for repairing the faulty unit. It features industry standard geared focus and iris rings that share a common position with other Samyang VDSLRII Cine lenses. Hybrid aspherical lenses render sharply defined images with a minimum of distortion and chromatic aberrations, and the minimum focus distance is 11" from the lens. 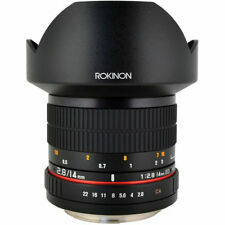 Rokinon Canon EF 14mm f/2.8 ED AS IF UMC Lens For Canon. Condition is Used but I only used it 4 times while having it. This lens is amazingly sharp and it perfect for landscape and night photography. It is also the version that auto focuses. Only reason why Im selling it is because I switched to sony mirrorless. Please ask any questions before bidding. High-speed, silent Contrast AF for both photos and movies with inner focus drive system. The world's lightest slim interchangeable single focal length lens. For a digital interchangeable lens as of September 21, 2010. 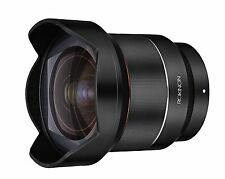 ROKINON New 14mm F2.8 Auto Focus Lens Designed specially for the unique rear element to sensor distance of Sony E mount full frame mirrorless cameras and with a bright f/2.8 maximum aperture, the Rokinon 14mm F2.8 AF achieves optimal performance with reduced size and weight. It’s IF (Internal Focusing) auto focus system is compatible with both phase detect and contrast detect sensors for fast, quiet and accurate focus detection. UMC anti-reactive coatings, three Aspherical and two ED lens elements combine to attenuate chromatic and spherical aberrations for outstanding image clarity, contrast and color fidelity with high resolution from the center to the corners of the image. 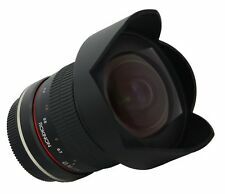 SquareTrade © AP6.0 PRESENTS: 14mm Ultra Wide F2.8 Lens Newest version with red ring! This beautifully constructed lens is a 14mm F2.8 IF ED MC Aspherical Super Wide Angle Lens. Rokinon has it available in all camera mounts. This listing is for a Pentax mount. This lens is designed for full frame cameras but can also work on APS-C cameras as well. This professional lens features 2 ED, one hybrid aspherical, and one glass aspherical lens element. The lens offers an impressive 114° field of view on full frame cameras and 92.5° on APS-C cameras. SPECIFICATIONS: ---Focal Length: 14mm ---Angle of View (Full Frame): 114° ---Angle of View (APS-C): 92.5° ---Maximum Aperture: F2.8 ---Minimum Aperture: F22 ---Lens Construction: 14 Elements/12 Groups ---Number of Diaphragm Blades: 6 ---Minimum Focus: 0. YONGNUO YN14mm F2.8 Description: 1) A Professional Lens of Capturing Grand View 2)High-precision,Ultra-low Dispersion and Aspherical Lens. It carries two high-precision aspherical glass lenses, one of which adopts ultra-low dispersion lens, which effectively compensates various optical aberration, minimizes chromatic aberrations, and provides excellent sharpness and color correction. 3) Precision-machined Abnormal Dispersion Lens: YN14mm 2. Lens is in excellent lightly used condition in my opinion and condition is as photographed with no issues, glass is clear.no fungus, no scratches.just a few small dust flecks.you will need to clean it to your specifications. 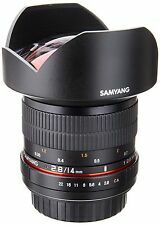 The Samyang 14mm F2.8 features a wide, ribbed manual focus ring which is smooth and well-damped. 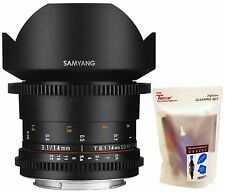 Samyang 14mm F2.8 ED AS IF UMC Ultra Wide Angle Lens. Even when used wide open at F2.8 its image quality is superb, and is perfectly suited for landscape photography which requires high quality images. Package Included: 1X 14mm F3.5 EOS M Mount Lens With Orignal Package Focal Length Type Fixed/Prime Focal Length 14mm MPN Does Not Apply Brand KAXINDA Compatible Brand For Canon Camera Type Mirrorless Camera Technology Digital Focus Type Manual Maximum Aperture f/3.5 Mount Canon EF-M Color Black Country/Region of Manufacture China UPC Does not apply. Lens&Optical system. There is no fog on inside of the lens. This lens works fine with no problems. You can enjoy taking photos with the lens in good condition. Excellent Condition. From JapanType: Ultra Wide AngleBrand: CanonSeries: Canon "L"
The Panasonic Lumix H-FS014042 has a focal length of 14 mm to 42 mm, which is a comparable Four Thirds and Micro Four Thirds focal length of 28 mm to 84 mm. With autofocus (AF) and auto exposure (AE), this Panasonic Lumix H-FS014042, built for Four Thirds function, for both photos and movies, is a versatile lens. 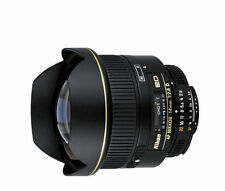 Nikon 14mm f/2.8 D ED RF Aspherical AF Lens. Focal Length: 14mm. Compatibility: Nikon. More than average wear for the age of the item, and may have dents, dings or finish loss. Glass may have marks or blemishes, but should not affect picture quality. Includes back mount cover / does not include any other accessories or covers. Focal Length 14mm. Front Lens Cap. Rear Lens Cap. (ex Russia). 100% Authentic Genuine Products. Note: This lens is manual focus lens not auto foucs， when you receive the lens , please 1.connect lens with your camera driectly 2.set you camera on M model 3.Manual Focus, Manual Adjustment the aperture. 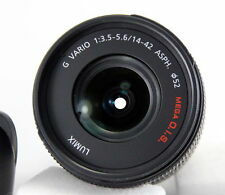 then press shutter take photo Description New Kaxinda 14mm f3.5 APS-C manual foucs lens for Sony NEX E mount camera . Corresponding mount: Canon EOS EF mount. Brightness: F2.8. Focal length: 14mm. Minimum focusing distance: 0.28m. Manufacturer Part Number: 883102. �E Body size: Length 228 mm. This lens is great quality & has only had a few photos shot through it. Works great for nature pictures as well as more artistic effects. Trending at C $298.59eBay determines this price through a machine-learned model of the product's sale prices within the last 90 days. Tiny scuffs from normal use. FOR REPAIR. There are few tiny dusts. There is no balsam separation. The warehouse is closed in weekend. Optics Grade . I send a product by EMS. EXCELLENT .